Pocono Stone is medium to large sized decorative landscaping stone. 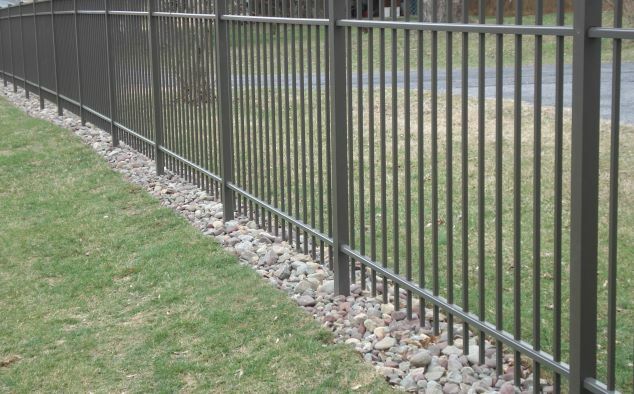 Adding Pocono stone at the base of a fence run eliminates the chance of damaging your fence while weed-whacking and fills gaps when the ground surface is uneven. Pocono stone can help to hinder those pets that are diggers and doesn’t decompose over time the way mulch does. When installing a fence with a Pocono stone base, a sod cutter is used to evenly cut the grass along the fence line before post holes are dug out. Pocono stone can be added with or without the use of landscaping fabric. Ultra’s UAF200 Flat-top aluminum fence pictured above sits at 54”h in Bronze. Click on Ultra’s catalog link on our Fence Vendors page for more information. Ensure your pets safety and comfort with a pre-fab kennel kit. All kennels are free standing, include 1-33”w gate with a patented dog-proof latch and use 1 3/8” galv. pipe/11gauge galv. chain link mesh. Other options include poly lumber floors, awning tops and incorporated dog houses. Quality’s pre-fab. dog kennel pictured above measures 6’w x 8’d x 6’h and includes the 18 oz. weight vinyl awning top. 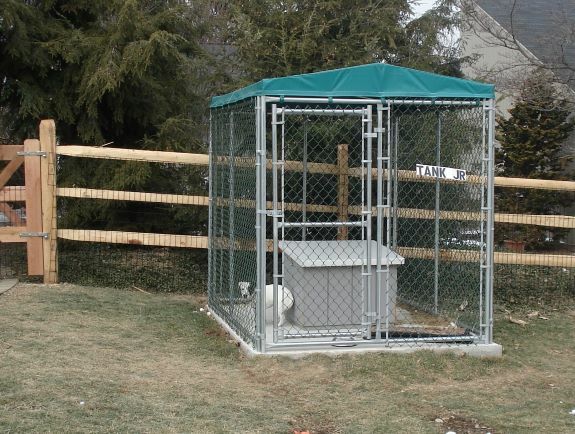 Kennel was installed on home-owners pre-existing concrete pad. Contact us to receive a brochure or for more information. Galvanized chain link temporary fence panels are available for rent anytime. Sections for rent include bases and measure 12’w x 6’h. Gate options include walk size or vehicle sized gates. Delivery of panels is available upon request; delivery fees may apply.